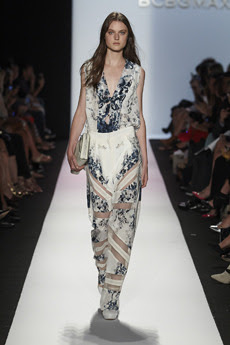 This year I was invited to the BCBG Max Azria and the Hervé Léger by Max Azria fashion shows! I was extremely sad in the end I was not able to go. Scheduling differences and the fact I had no idea I was going to be invited, I was not prepared what so ever. They send out invitations within the week or two before the shows, so it's very last minute and I was so sad I was not able to go. With that being said, I seriously hope I will be invited next year, which I will be prepared and ready to go!! I wanted to highlight the shows! They were stunning and although I'm ecstatic for fall fashion, looking at the spring 2014 previews, makes me happy for next spring/summer. 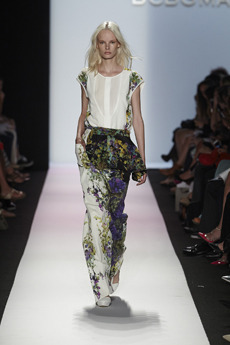 Here is a preview of the BCBG Max Azria show. “We were inspired by nature and modern art. Contemporary art inspired the choice of vivid colours, while more muted tones glean inspiration from the natural beauty of the world around us", says Lubov Azria, Chief Creative Officer of BCBG Maz Azria. says Lubov Azria, Chief Creative Officer of Hervé Léger by Max Azria. I'm in love with both collections. I think Hervé Léger in my books is more what I prefer with lot's of geometric stripes and shredded crop tops. Which show was your favorite this year!! ?